Anthony Sudekum Johnston, age 73, died Friday, October 5th, 2018 at Alive Hospice Residence. He was the son of the late Daniel W. Johnston and Nettie Elizabeth Sudekum Johnston and brother of the late Daniel W. Johnston, Jr. and Frances Johnston Earthman. Tony is survived by his wife of 47 years, Patricia Long Johnston, and sons Bart Anthony Johnston (Bonnie) and Christopher Sudekum Johnston (Melissa) and four grandchildren, Ryan, Parker, Mary Windham, and Dempsey Johnston. Tony was adored by his family and deeply loved and respected by his many friends. He was known for his gentle spirit, integrity, and unquenchable zest for life. He spent many hours on the trails and roads of Percy Warner Park. He was an enthusiastic fan of Vanderbilt University and was a long time ticket holder for the basketball and football programs. He was an active supporter of the YMCA of Middle Tennessee and served as a member of the board of the YMCA Foundation. He was a board member of the Green Hills YMCA, where he spent many hours in various programs, and enjoyed the friendship of many members and staff. He was quite the avid adventure traveler; frequently traveling with good friend, Alex Steele, who died much too early. They traveled to exotic destinations including Italy, Romania, Bulgaria, Myanmar, Thailand and Wales. His rudimentary knowledge of Spanish facilitated travel to Peru, Bolivia, Chile, Guatemala, Honduras, Mexico, Costa Rica, Dominican Republic and Cuba. Iceland was a favorite. Tony was an enthusiastic supporter of St. George’s Episcopal Church, Oak Hill School and Montgomery Bell Academy. He was a former director of the Adventure Science Center. 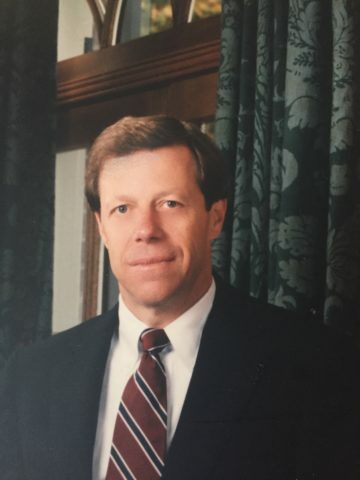 He was a long time member, director, and vice-president of the board of Belle Meade Country Club. A celebration of his life will be held at St George's Episcopal Church, 4715 Harding Pike, on Tuesday, October 9th. Visitation with his family will begin at 2:00pm followed by the service at 3:30pm. In lieu of donations, Tony asked that you please travel to the Atacama Desert or other exotic destinations where English is not the first language, make new local or fellow traveling friends, and leave a small rock in memory of kindred travelers.